Hello and welcome to Vector Fine Art Prints. 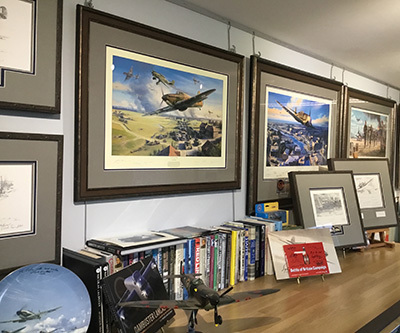 Here you will find a wide selection of Aviation Art prints by renowned artist's such as Frank Wootton, Robert Taylor, Nicolas Trudgian, Gil Cohen, John Shaw, Michael Turner and Ron Stark. 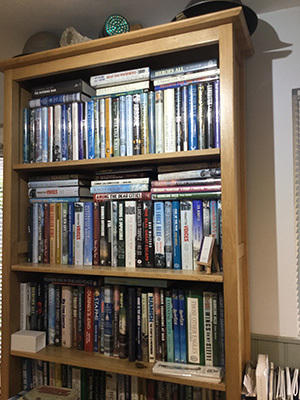 The choice of signed books is second to none and is so extensive that nowhere else can match it online. We specialize in limited edition bookplates and take part in several book launches throughout the year. For our forthcoming calendar visit the special events page. we suggest you signup to our email newsletter. Just follow the link to the left or on our newsletter page. Also add this page to your favourites so as you're only one click away. 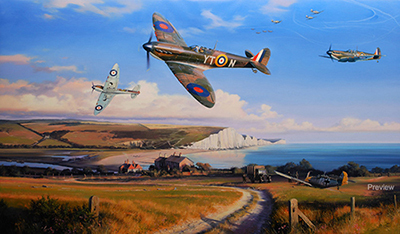 At the height of the Battle of Britain September 1940, the Spitfires of 92 Squadron, patrol the coast in the late afternoon sun. Having the instruction that the coast is clear of enemy aircraft they are ordered to return to their base at RAF Biggin Hill. Joined the RAF on a short service commission in August 1939. When training was completed and converting to Spitfires he was posted to 92 Squadron on the 21st May 1940. 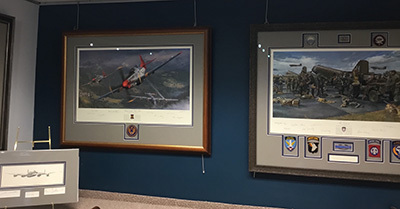 In June the Squadron was based at Pembury and then moved to the famed Biggin Hill base in September, flying throughout the Battle of Britain with 92 Sqn with a victory on the 11th September and the destruction of a Ju88 on the 27th. In August 1941 he was posted to 52 OTU as an instructor. Joined the RAFVR in July 1938 and was called up for active service on September 1st, converting to Spitfires he joined 64 Squadron in early July and moved to 19 Squadron at Fowlmere on the 12th September flying as part of the Big Wing. In November he re-joined 64 Squadron at Hornchurch. 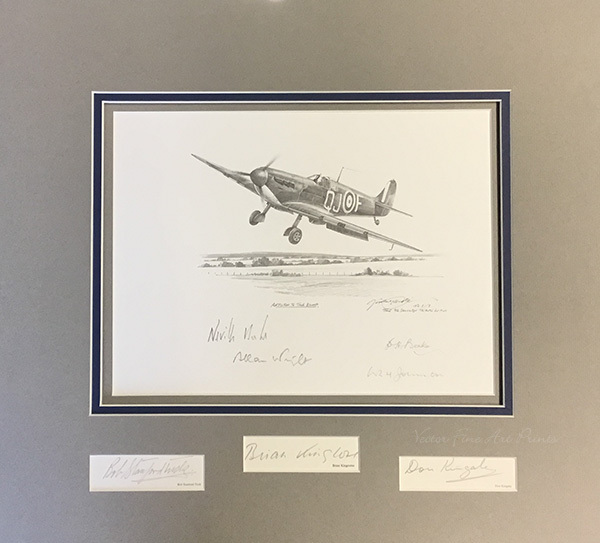 Commissioned in the RAF in March 1938, after initial training and converting to Spitfires he was posted to 74 Squadron on the 29th October. On the 21st May 1940 he claimed his first victory over the beaches of Dunkirk, scoring several more in quick succession. During the Battle of Britain he had multiple victories for this he was awarded the DFC on the13th August 1940. 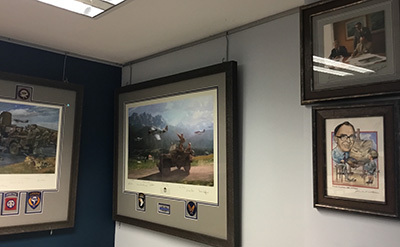 He was made a Flight Commander on the 28th. Scoring several more victories before being posted to 57 OTU on the 6th June 1941. On the 1st May 1939 he joined the RAFVR. On 2nd September he was called up for full time service, after initial training he was sent to Sutton Bridge to convert to Hurricanes. Commissioned on the 9th June he was then posted to 605 Squadron on the 6th July. 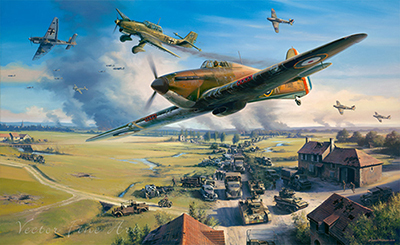 In combat with a Bf109 on 27th September his Hurricane was badly damaged, which he force landed at Gatwick, the following day he damaged a Ju88. Also seeing intense combat throughout October for which he clamed several victories. September 1941 he was posted to 55 OTU. His final score was 6 victories. Entering the RAF as a Flight Cadet at Cramwell in September 1939, on completing training was posted to 1 Sqn. on the 15th July 1940 flying Hurricanes, the following day he was engaged in combat over Portsmouth where his aircraft was badly damaged. Bailing out he landed at West Wittering and admitted to a hospital at Chichester. He returned to the Squadron on October 1st where he achieved two victories he served with the Squadron until April 1941. In March 1939 joined the RAFVR. After initial training and converting to Spitfires he joined 602 Squadron at Drem on the 18th June. They were posted to Westhampnett where he claimed a BF 110 destroyed on the 25th August and another on the 7th September. He was injured on the 9th September and did not return to operations until the 7th October claiming a BF 109 destroyed on 29th. He stayed with the Squadron until the 2nd September 1941. Joining the RAFVR in October 1938, Tom was called up for full-time service on the 2nd September. After initial training he was commissioned and joined 249 Squadron in May 1940 flying Hurricanes. On the 7th September he claimed a Bf 109, on the 11th an He 111, two Bf 109s on the 15th and a DO 17. On the 27th he destroyed a Bf 110 and a JU 88 and also a Bf 110 probable destroyed and sharing a JU 88. In October he shared a DO 17 on the 25th and destroyed a BF 109 on the 27th. On the 7th November he also destroyed a JU 87 and two BF 109’s, but on this day he collided with another Hurricane, bailing out unhurt. For these remarkable victories he was awarded a DFC on the 8th October 1940 and a bar on the 26th November 1940. Called up on active service 1st September 1939, after initial training he was posted to 7 OTU to convert into Spitfires, joining 616 Squadron in Kirton-in-Lindsey. On 17th October joining 19 Squadron as part of the ‘Big Wing’. January 1941 he was posted to 56 OTU as an instructor. Joined the RAFVR in April 1939. After training and converting to Spitfires, he joined 64 Squadron on the 22nd September. He served with the squadron at various stations before being posted to 92 Squadron at Biggin Hill in June 1941. 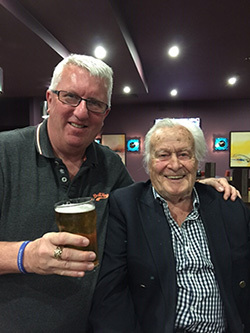 Joining 92 Squadron in 1941 as a sergeant pilot, he flew missions with Don Kingaby, and flew rhubarb mission with 609 and 74 Squadron flying the MarkV Spitfire. He flew under the leadership of Brian Kingcome who put him forward to be commissioned. In an action on the 24th July he had 2 enemy aircraft damaged. After seeing combat with 92 Squadron he was posted to Digby. Joined the RAF in 1940 at the age of 18 received his wings in Feb 1941, converted to Spitfires joining 92 Squadron at Biggin Hill. His first victory was a BF109 over Dunkirk. Duke often flew as Wingman to the legendary Sailor Malan who was the Leader of The Biggin Hill Wing. November he was posted to the Western Desert with 112 Squadron and then in 1943 he rejoined 92 Squadron as a Flight Commander. By the end of the war he became a multiple Ace and after became the legendary test pilot. He entered college RAF Cranwell in 1938 as a cadet. On training he joined 92 Squadron flying Blenheims and being re equipped in March 1940, he fought over Dunkirk claiming victories, and was with the Squadron throughout the Battle of Britain claiming several more enemy aircraft, he was awarded the Distinguished Flying Cross in September 1940 and a bar in July 1941 posted away from the famous 92 to 59 OTU. Being reposted to operations with 29 Squadron in March 1943. Joined the RAF in a short service commission at the age of 19, in September 1935. His first posting was to 56 Squadron flying Hawker Demons. 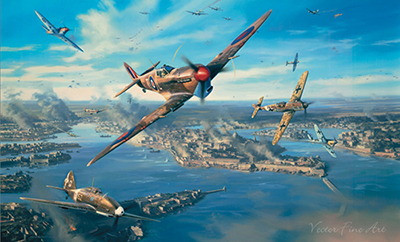 At the beginning of May 1940 he joined 92 Squadron where he saw action over the Dunkirk beaches claiming several victories. 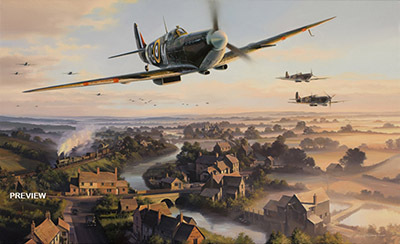 Serving with 92 Squadron in the Battle of Britain as a Flight Commander claiming more victories before being posted to Command 257 Squadron .After this he was posted back to command the Biggin Hill Wing where he was shot down in January 1942 and was taken POW, he was credited with 29 air victories. 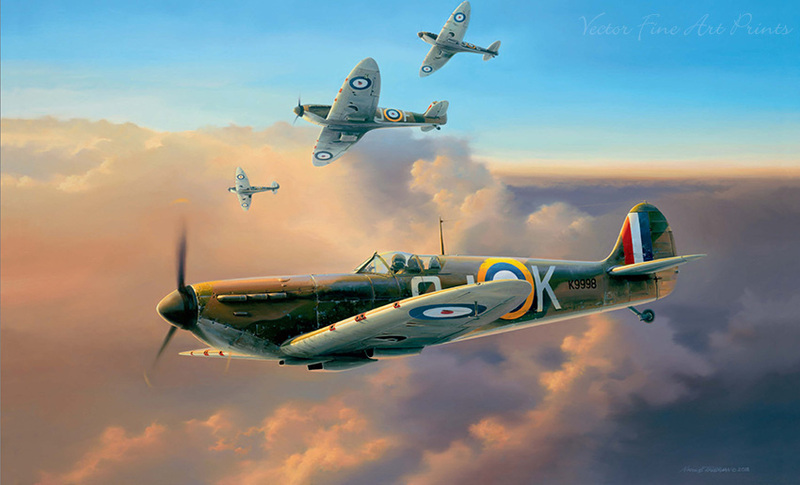 Joining the RAF on a permanent Commission and after initial training he was posted to 65 Fighter Squadron they were then re-equipped with Spitfires and fought over Dunkirk. 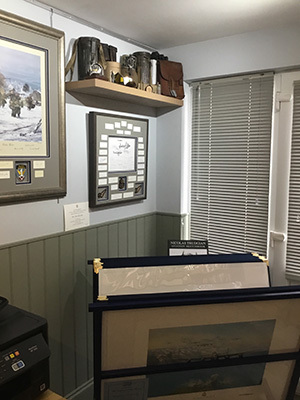 After this period he joined 92 Squadron with Bob Stanford-Tuck, and moved back to Biggin Hill at the end of August where be became the acting Commanding Officer. 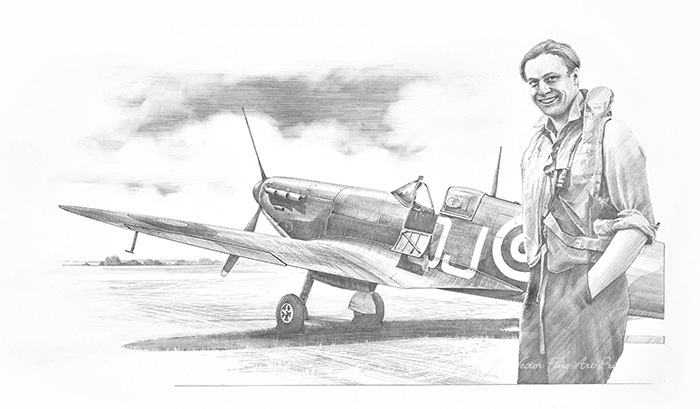 Flying Officer Geoffrey Wellum standing by his faithful Spitfire at RAF Biggin Hill. aircrew over a vast number of years, many of whom have become close friends. or a donation was made to a charity of their choice. As always: Nick’s superb remarques are available from him direct. 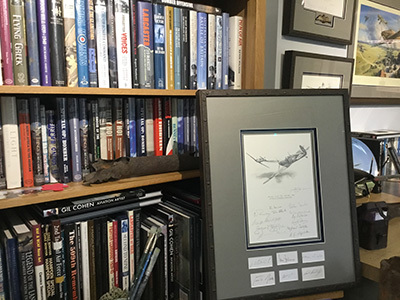 We have the honour of introducing the aviation art of Mark Postlethwaite to our extensive range of already collectable fine art prints by the leading aviation artists. Our stock is constantly changing and we have exclusive offers that are not on our website!